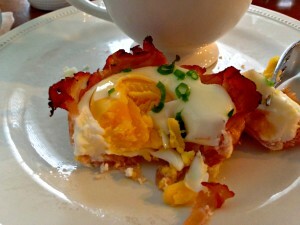 Inspired by our recent B&B getaway, we recreated the leisurely breakfast experience at home. The key to a successful multi-course breakfast is timing. 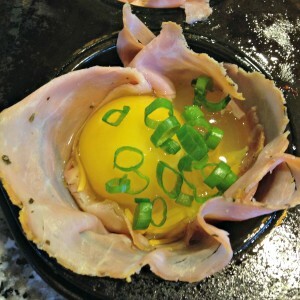 This ham and egg cup recipe takes only a few minutes to prepare and bakes in just 15 minutes, perfect for a leisurely family breakfast or to entertain overnight guests. Enjoy! This recipe is inspired by a paleo friendly recipe I discovered at Oh Snap! Let’s Eat! Tina’s original recipe calls for only three ingredients. Here’s my four-ingredient version. 12 slices of Boar’s Head parmesan-pesto ham, sliced thin. 2. Spray muffin tin with non-stick cooking spray. 3. 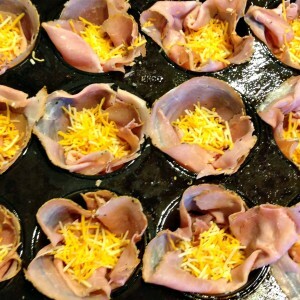 Make ham cups by folding ham and rolling to fit in tins. We chose the Boars Head parmesan-pesto ham because of its flavor which pairs well with eggs and cheese. 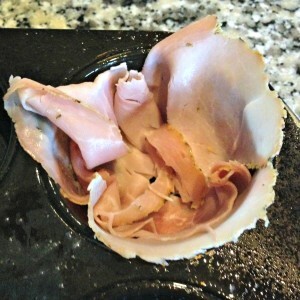 Use whatever ham (or turkey ham like Tina did in the original recipe) you like. 4. Add about 1 tablespoon of cheese to each cup (optional). 5. Crack egg and pour into cup. 6. Sprinkle scallions over top. 7. 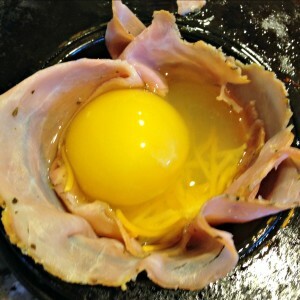 Bake 15 minutes for hard cooked eggs with glossy, set center. If you prefer hard cooked eggs, add an extra minute or two. For gooey egg centers, decrease cooking time (safe cooking practices require an internal cooking temperature of at least 160 degrees). Store leftovers up to three days in refrigerator. My hubby says they taste even better cold. You can also SHARE this recipe with friends and family using the buttons below. 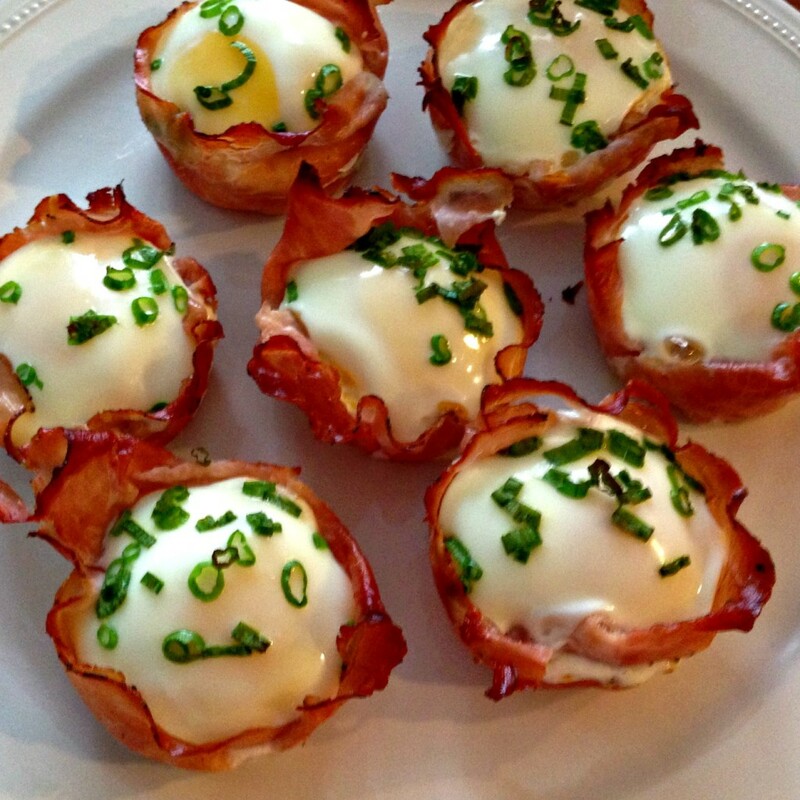 Save it to Pinterest (make a staycation breakfast board!!!) so you can find this delicious dish when you want to cook for your family! It is that easy! Quick. Tasty. Fun. This would be a fun way to switch it up for dinner. 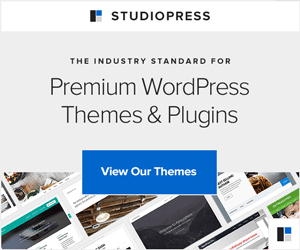 I needed this idea – thank you! It’s a great lunch, too. Can go in kids’ lunch boxes cold. Yummy! OMG! That looks delicious!!!!! I am pinning this to my recipes right now. My boys would love it. My family has requested it again already. On our menu for the next family day — October 12!